If you’re a performing artist, and you deal with any kind of musculoskeletal plain, we know how the pain can affect your work and your quality of life. Here at Advanced Integrative Rehabilitation and Pain Center, we specialize in working with performing artists who could benefit from both our preventative and rehabilitative efforts to address medical problems that people who are involved in the performing arts are faced with. If you’d like to learn how we can help with your musculoskeletal pain management and rehabilitation in our D.C. office, please keep reading. Due to the extent to which performing artists are involved in their craft, it is not uncommon for artists to experience musculoskeletal injuries and pain in relation to their art. For trombonists, 76 percent have reported in a survey that they have pain in either their lips and jaw, their left upper extremity, and their back region. For pianists, 50 percent reported in a survey that they believed that pain was simply a normal part of playing the piano. When a group of 153 dancers were surveyed, 47 percent claimed to have at least one dance related injury. 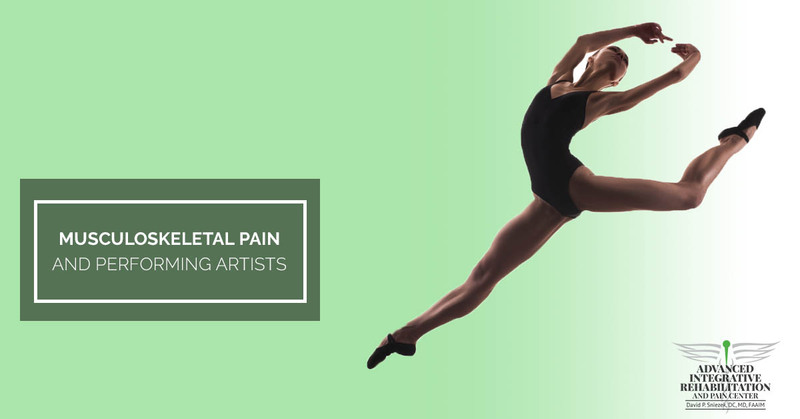 Repetitive movements and overuse of a certain area of the body are two of the biggest causes for musculoskeletal pain and injury, which would explain why so many performing artists are dealing with injuries and pain. If you’re a performing artists and you’ve suffered a musculoskeletal injury or you’re trying to determine the cause of your pain, we have diagnostic and treatment options for you here at Advanced Integrative. Electromyography/ Nerve Conduction Study (EMG/ NCS) – This type of testing can diagnose both nerve and muscle conditions. Our very own Dr. Sniezek has worked diligently in order to develop a method of testing that helps to reduce anxiety and the discomfort that can come from EMG testing. Musculoskeletal Diagnostic Ultrasound – This type of visual representation of ligaments, tendons, muscles, and nerves allows our physicians the ability to diagnose problems as well as to treat areas of the body with injection procedures. Aside from our ability to diagnose musculoskeletal injuries, we can also offer pain management through various channels such as the injection procedures mentioned above, chiropractic care, acupuncture, as well as other integrative therapies that will work to not only help you cope with the pain, but will also work to enhance your overall well-being on a physical, emotional, and spiritual level. For any performing artist, it’s important to know that there is a solution for your musculoskeletal pain, and that you can also take measures for preventative treatment in order to preserve and protect your talent and passion. If you’re interested in learning more about our dedicated work with performing artists and our desire to prevent, treat, and rehabilitate medical conditions you’re susceptible to, contact us today. When you’re in need of pain management and rehabilitation in Washington D.C., Advanced Integrative Rehabilitation and Pain Center is here to help. We look forward to working with you.